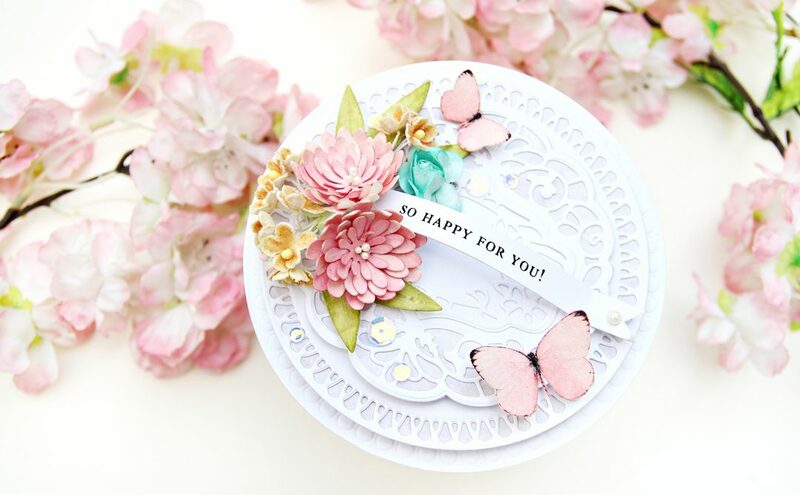 My name is Karin Åkesdotter (You find me on Instagram as Peppermintpatty42 and my blog is PeppermintPatty’s Papercraft ) and I am thrilled to be here today to share five projects that I’ve made with the absolutely wonderful Vinatge Treasue Collection by Becca Feeken. I can never stop being fascinated by how dies work and the beautiful result that comes out at the other end once you’ve rolled your die and cardstock through the die-cutting machine. 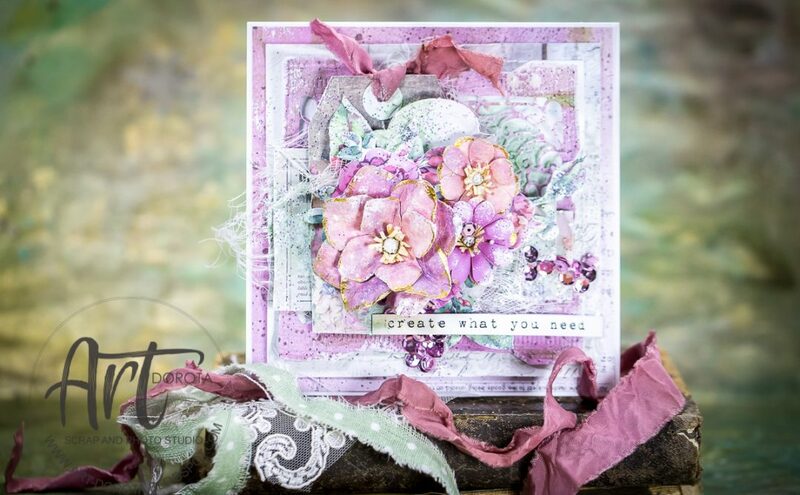 It’s a joy to work with the collection – so many beautiful dies and endless possibilities. 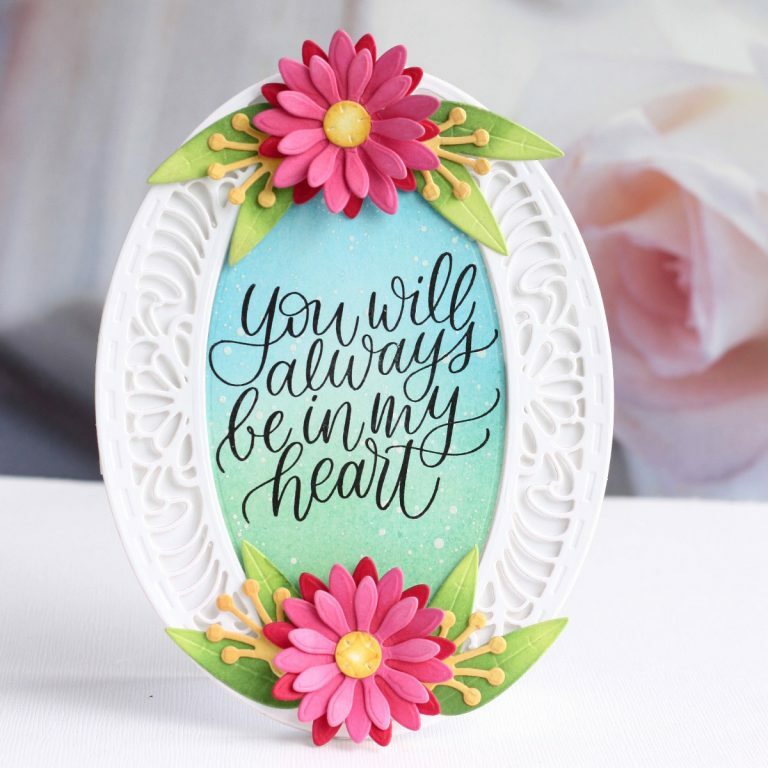 The first dies that caught my eyes were the beautiful oval from Bella Luce Ovals and the lovely flower dies in Cinch and Go. 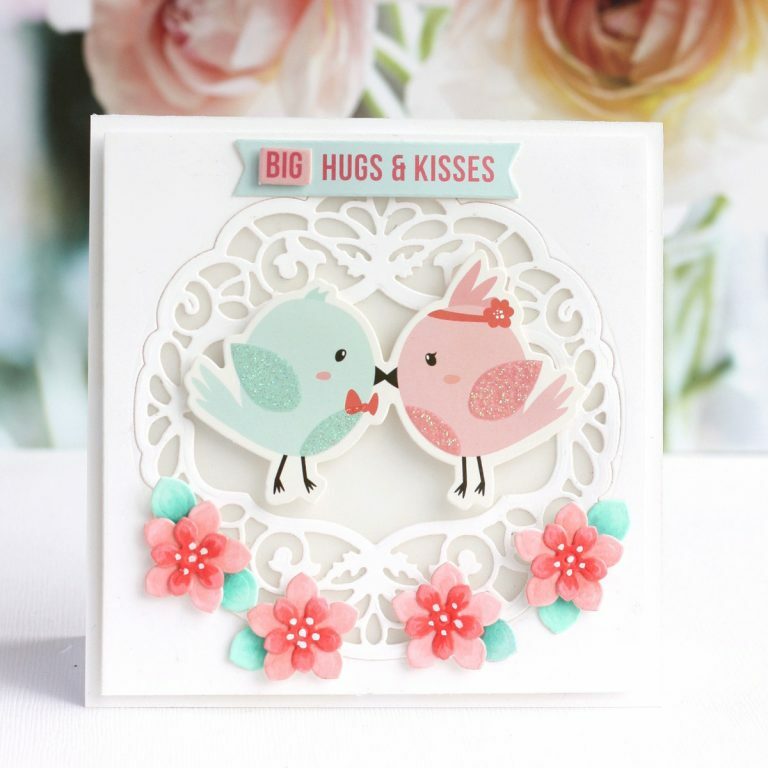 I love that every intricate die come with and coordinating solid background die – it makes beautiful cardmaking so easy! For this card I simply die cut the oval from white cardstock and adhered it to the oval background using foam tape to get a bit of dimension. I then die cut and inked the flowers from Cinch and Go V and assembled them using glue dots. 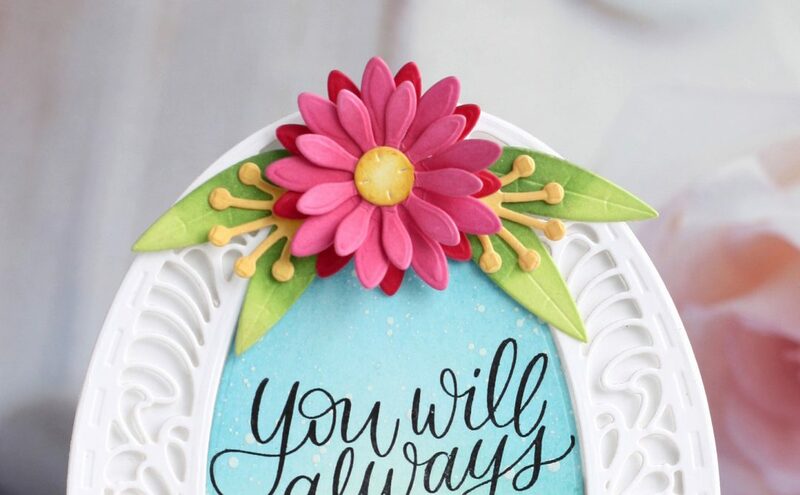 Before I adhered the flowers to the frame I inked the leftover oval and stamped the sentiment to the center. Make sure your inked background is completely dry so the sentiment looks crisp when stamped. Attach flowers. 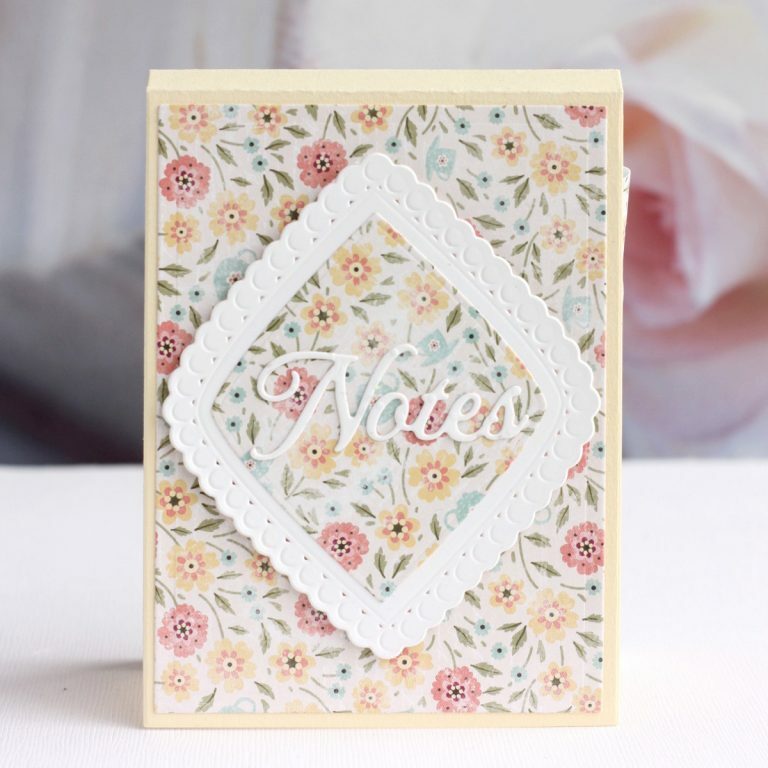 For my next project, I made a white card base and then die cut the very beautiful Cannetille Rectangle from white cardstock. I lay out the rectangle on the card base and stamped my sentiment to the center of the card base before adhering the lacey rectangles to it. I used foam adhesive and used strips for the edges but larger pieces where I knew I was going to place my flowers for extra stability. I then die cut the flowers from the Adorned Notepad set and colored them using Copic markers and white (opaque) watercolor. The leaves are made from the largest flower. I then adhered the flowers with glue dots to create a little flower wreath around the sentiment. Project #3 was so fun to make, very simple and fast but I just LOVE the result This will be a little mini Easter gift for family and friends. 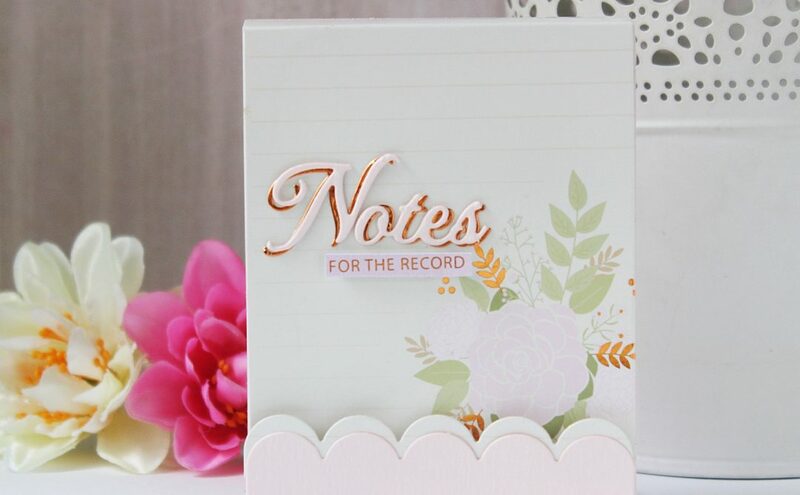 I just die cut the pieces from Adorned Notepad and they are super easy to assemble. Then you can decorate it any way you want. For my CAS version, I used beautiful paper from BoBunny and then the pretty lacey diamond shape from Nobel Chatelaine. 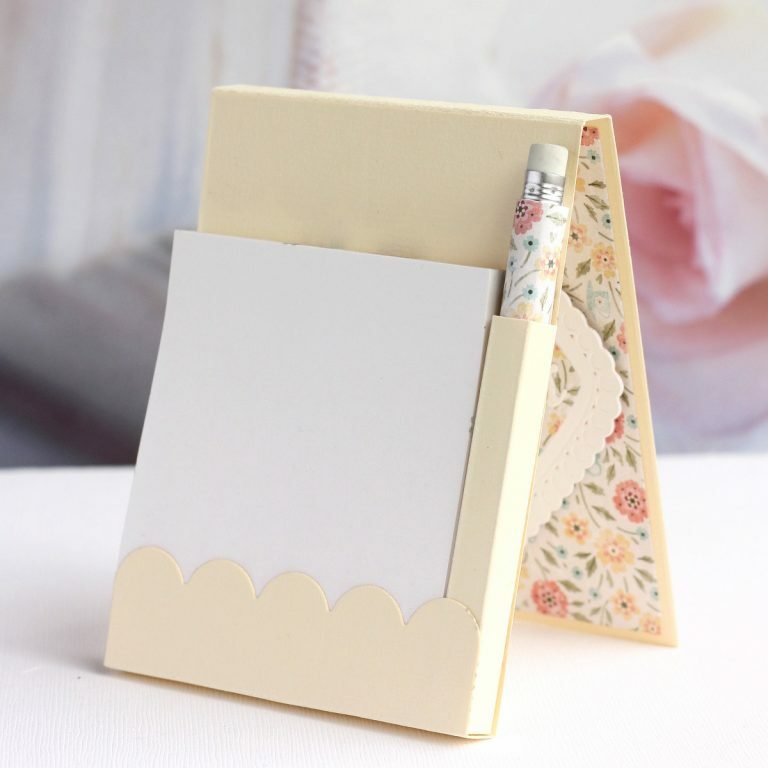 To make my pencil match the set I simply glued on a piece of the same patterned paper I had used for the front panel decor. My next project would make a pretty wedding or anniversary card. I made a square card base from white card stock and then cut another square piece slightly smaller than the base. I then cut the lovely Brillante Rondelle through the center. I then removed the die cut and adhered a piece of vellum to the back of the panel. It was then easy to attach the lacey circle back in the center of the square panel. I then adhered the panel to the card base using foam adhesive before adding the sweet cardstock images from the Spellbinders January Card kit. Last but not least I created some flowers (the same way as for project # 2) to add even further beauty and dimension to the card. I’m finishing off with a fast and easy card. 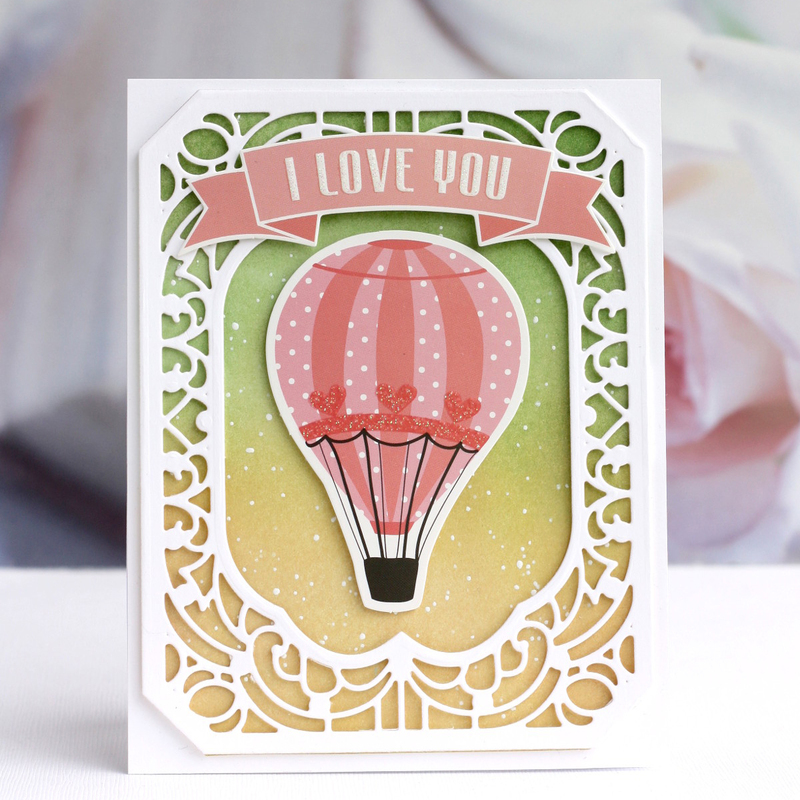 I really love the beautiful die cuts from the January kit and created a rectangle card the same way as I did my first card. 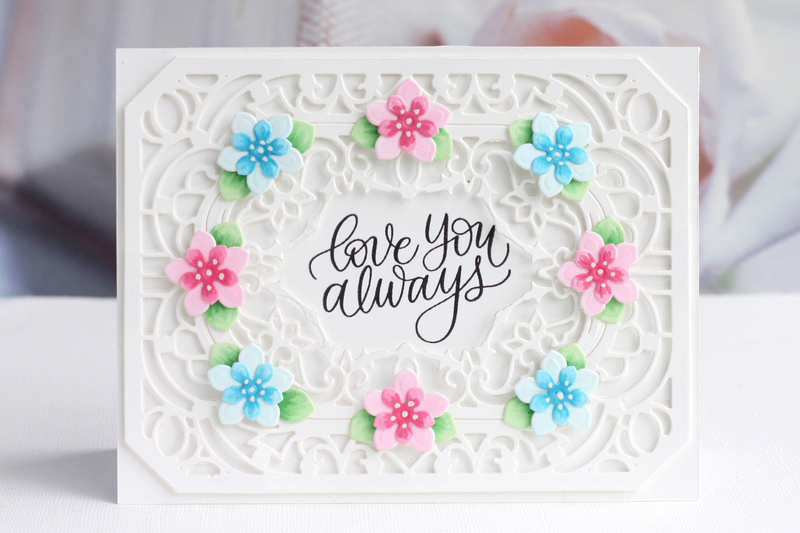 Make a card base from white cardstock and adhere an inked panel to the base. I had spattered this one with white (opaque) watercolor for a bit more interest. I then adhered my die cut frame to the card with foam adhesive and last added some pretty die cuts from the January kit. You can of course add any images, stamped or printed that you like.